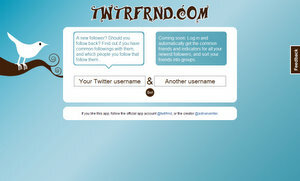 twtrfrnd is a handy tool to discover common Twitter friends with another Twitter user. The service is very simple to use, just enter your Twitter user name and that of the person you are interested to find common friends with, and click "Go!". The results are neatly grouped which makes it easy for you to quickly make a decision of whether to follow that person or not. twtrfrnd is the creation of Adrian Winter, and you can follow the updates on Twitter @twtrfrnd.